L-Carnitine is an amino acid found abundantly in skeletal and heart muscle. It functions primarily to support fat utilization, and also acts as a carrier of fatty acids into the mitochondria, where they are oxidized and converted to energy. l-carnitine also facilitates the removal of short and medium chain fatty acids from the mitochondria that accumulate during normal metabolic processes. A randomized double blind, placebo-controlled trial of Pure Encapsulations l-carnitine involving 101 volunteers indicated that l-carnitine maintained healthy cardiac enzymes including lipid peroxides and lactate dehydrogenase. In combination with other cardiovascular support agents, l-carnitine supported ventricular function and superoxide dismutase enzyme activity in human volunteers. Long-term l-carnitine supplementation indicated positive support for cardiovascular health after a 3-year follow-up in adult subjects. A recent placebo-controlled clinical study conducted at Ball State University in Indiana has found that l-carnitine-l-tartrate supplementation helps physical recovery from high intensity exercise. 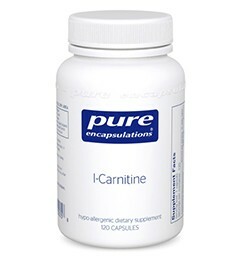 l-carnitine-l-tartrate contains 68% pure l-carnitine and 32% natural l-tartaric acid. l-carnitine-l-tartrate is a highly stabilized form of l-carnitine supporting cardiovascular health and recovery from exercise. What Is The Source?l-Carnitine-l-tartrate contains 68% pure l-carnitine and 32% natural l-tartaric acid. Vitamin C (ascorbyl palmitate) is derived from corn dextrose fermentation and palm oil. Hypo-allergenic plant fiber is derived from pine cellulose.